This is how Honda’s SP-2 will look when you see it for the first time at this autumn’s big bike shows. Honda has committed itself to continually developing its WSB machine – reflecting the changes made for performance on the track in road-going versions. The SP-2 is the proof. Our computer-generated image shows the changes are small but significant. On the outside, the frame looks identical to the current machine’s – but inside there are structural modifications to improve rigidity and give riders better feedback at the limit. One of the major alterations is to the headstock. The SP-1’s steering head is already innovative, using a patented design that allows the air for the pressurised airbox to run from the central scoop in the nose straight through the frame without any complicated ducting. However, while Honda still has faith in the design it has decided it can be improved. As a result, sources in Japan claim the bike will feature a redesigned steering head, retaining the same basic concept but featuring a new internal structure to improve the frame’s rigidity in that area. The new headstock is also expected to feature a slightly revised head angle. The chassis get changes at the back, too. The SP-2 is expected to feature a new, stiffer swingarm with revisions to the linkages reflecting the alterations made to this year’s WSB machines. The riding position, which has been tweaked to make the bike easier to hurl around corners. Again, the modifications are WSB-inspired. When the SP-1 was first put on the track, riders complained that the position of the bars and the shape of the fuel tank were less than perfect – making it harder than necessary to move around on the bike. Since homologation rules allow these parts to be changed, they had their wishes answered immediately, while road riders have had to make do with the original set-up. Now the road bikes are expected to get the same dimensions as the racers. The fuel tank is slimmer, with bigger cut-outs for the rider’s knees, while extra height means the bike doesn’t lose any fuel capacity. In fact the SP-2 may carry even more fuel than the current SP-1. The road bike’s tank range is one of its few faults – it often does less than 100 miles between fill-ups. However, despite the revamp, there won’t be many visual clues to distinguish the SP-2 from the original SP-1. The bike’s bodywork was originally designed with aerodynamics rather than aesthetics in mind, and its straight-line performance on the track shows there isn’t much to complain about on that score. New paintwork and the obvious " SP-2 " stickers will be the main giveaway. However, look closer and you may be able to spot the new exhaust system, designed to be freer-flowing than the current one. Some sources reckon the bike could even gain high-level cans, as used on the WSB bikes – as show in our image of the bike. This would, however, mean the loss of the road bike’s pillion seat, so such an exhaust system is more likely to be available as an option rather than be fitted as standard. So far, Honda is playing down any alterations to the engine, but expect a series of tweaks to improve performance and power delivery. The current SP-1’s throttle response is less than perfect, particularly at low revs where the fuel injection seems to struggle to cope with small throttle openings. No doubt Honda’s engine gurus will have come up with revisions to the system and its engine management mapping to counter this. Power is likely to increase slightly thanks to the exhaust and injection alterations, but don’t expect more than a couple of extra bhp. 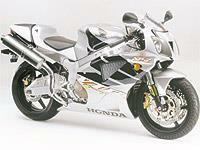 Honda intends to launch the SP-2 in mid-September – so look out for photos and full specifications on this site soon. The bike should go on sale around Christmas, priced around the same as the current SP-1 at about £10,000.